It’s a challenge to come up with gift ideas for my brother. His Christmas list this year wasn’t helpful either (“beer, beer, and beer”). My family is odd, but I still couldn’t give my brother only beer and a homemade cross stitch that said “BITE ME” for Christmas. So I decided to round out my big brother’s gifts with an ice cream flavor developed just for him. Since we loved banana-flavored sweets growing up, it had to be banana. 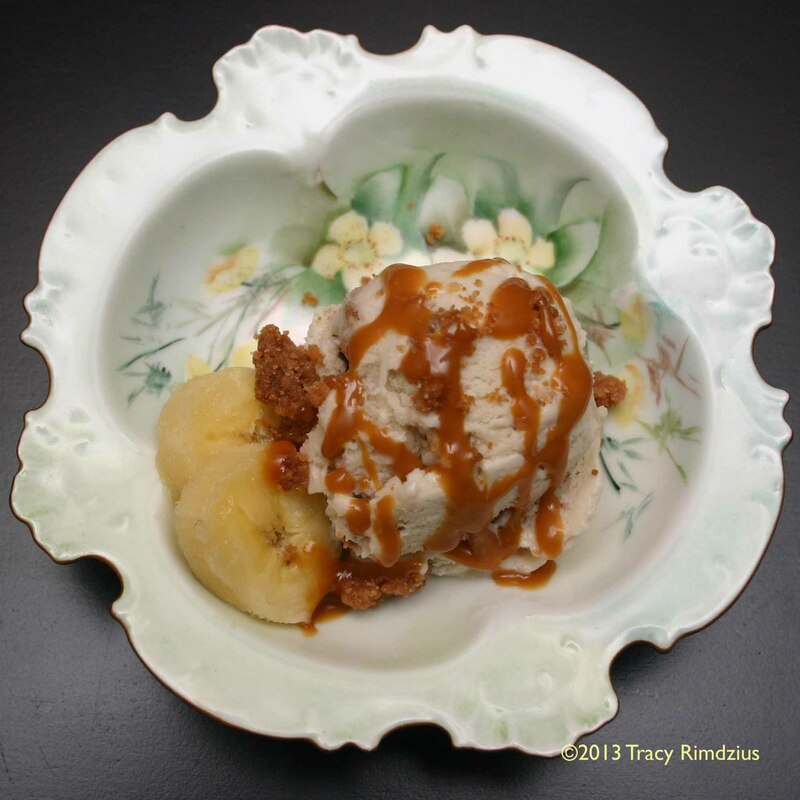 I created an ice cream inspired by one of my favorite desserts, the “Old Fashioned Banana Pudding” at Artie’s. No matter how full I am after a meal there, I can always make room for the rich cloud-like pudding sprinkled with caramelized vanilla wafers and drizzled with chocolate and caramel sauces. I developed this flavor in honor of my brother and our childhood love of banana desserts. He can’t eat chocolate, so I included a salted butter caramel swirl and caramelized vanilla wafers. But this ice cream would be lovely with the addition of a chocolate swirl or topping. I caramelized the crap out of the vanilla wafers so they wouldn’t get soggy in the ice cream. For the caramelized vanilla wafers: melt 4 ounces (1/2 cup) butter over low heat in a saucepan and add 1.75 ounces of sugar and 2 cups crushed mini Nilla wafers. Stir over the heat for about 10-15 minutes (or until the cookie crumbs brown). The mixture will look like inedible mush, but it will harden after cooling (if it doesn’t, pop the crumbs on a sheet pan and bake in a 350 degree oven for about 10 minutes). Spread the caramelized cookie crumbs onto a baking sheet in a single layer and allow to cool and harden before mixing them into the ice cream. For the salted butter caramel sauce: melt 3 ounces (6 tablespoons) salted butter in a deep pot 4-quarts or larger and stir in 5.25 ounces of sugar. Cook over medium-low heat, stirring until the sugar is a medium golden brown (it will taste too burnt and bitter if cooked to deep brown or smoking). Remove the pot from the heat and whisk in 4.2 ounces (1/2 cup) heavy cream while wearing an oven mitt to protect your hand from the bubbling caramel. Stir in 1/2 teaspoon of vanilla extract and another 4.2 ounces of heavy cream. Whisking over low heat helps melt (if you are patient!) any hardened caramel stuck to the bottom of the pan. Let the sauce cool to room temperature before layering into the ice cream. Store leftover sauce (I added about half a cup of sauce to the ice cream and had about a cup left) in the fridge for up to two weeks. Reheat in the microwave to serve as additional topping for the ice cream. This looks amazing! When can I have some?? ?